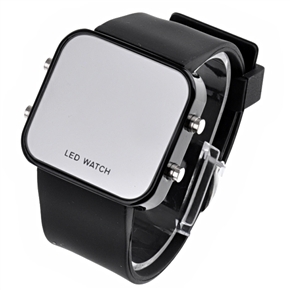 Our cool black mirror surface LED watch will just upgrade your sense for watch then! It is both ornamental enough for the bright color and practical enough as working! Used as a reflective mirror as well; you can try it! - More fancy color choices for you. - Rubber material wristband; comfortable enough when wearing. - Red LED display; clear enough. - Mirror dial design; special enough. Customer Rating: 6 customers would recommend this product to their friends. Agree with them, or you have different ideas? Write your comments. It′s a nice watch. It impresses people that look at it. It′s very easy to set the time. To turn on the light you have only to press any button. In my opinion it was a very good surprise. Great service, I received the card within a few days of paying for it! Wow that was fast! Great seller!! !